Above: Class 03 - caption to follow. 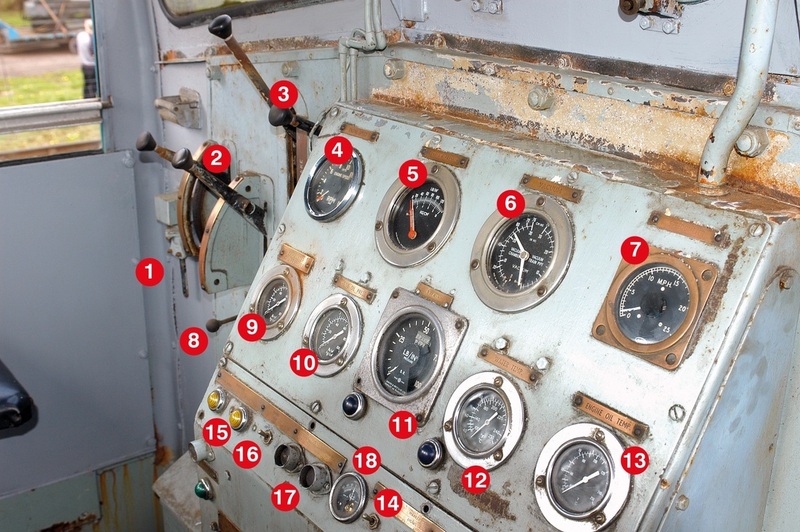 12: Engine stop button, 13: Engine speed controller, 14: Reverser lever, 15: Fuel tank gauge, 16: Sanding lever. Above: Class 04. Drewry Car Co, Gardner-engined 0-6-0 diesel-mechanical. Class 07. 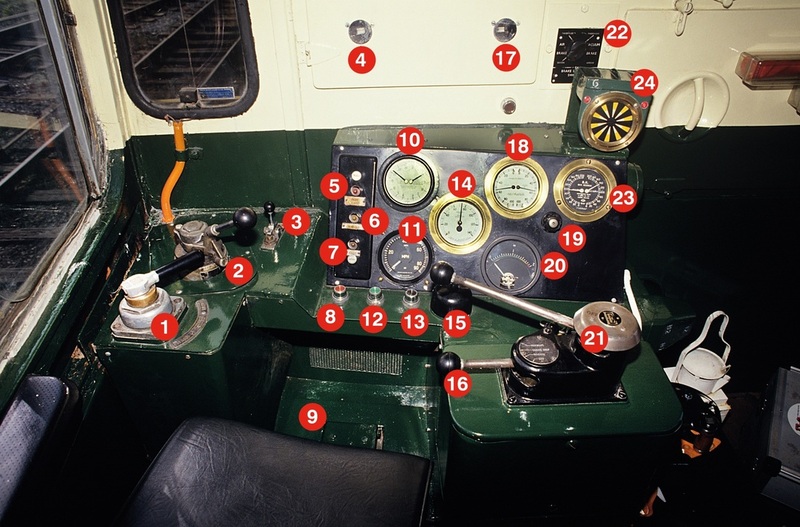 1: Overchange release valve, 2: Master switch and power controller, 3: Brake controllers, 4: Engine speed dial, 5: Air brake gauge, 6: Vacuum brake gauge, 7: Speedometer, 8: Horn valve, 9: Vacuum exhauster oil pressure gauge, 10: Engine oil pressure gauge, 11: Brake pipe pressure gauge, 12: Water temperature gauge, 13: Engine oil temperature, 14: Marker light switch, 15: Warning lights, 16: Panel light switch, 17: Engine start/stop buttons, 18: Battery ammeter. 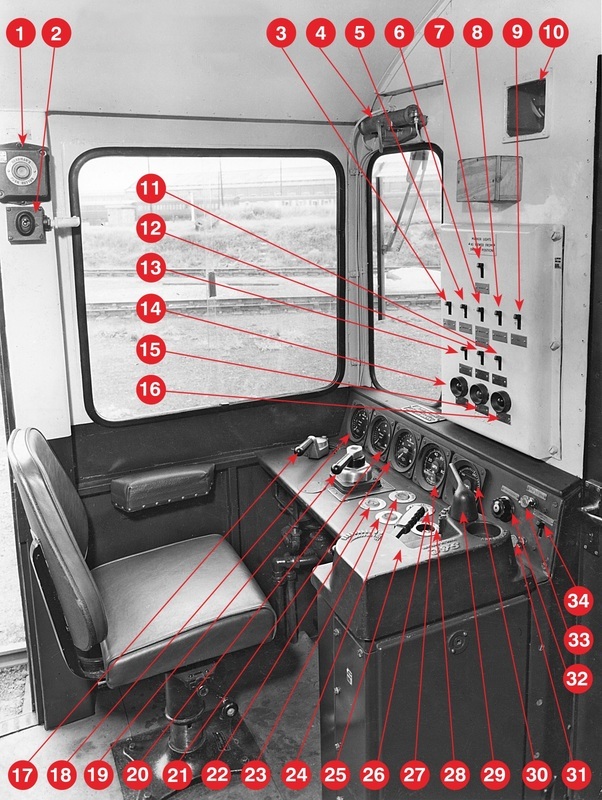 Above: Driving cab layout of standard 0-6-0 diesel-electric shunting locomotive - Class 08. 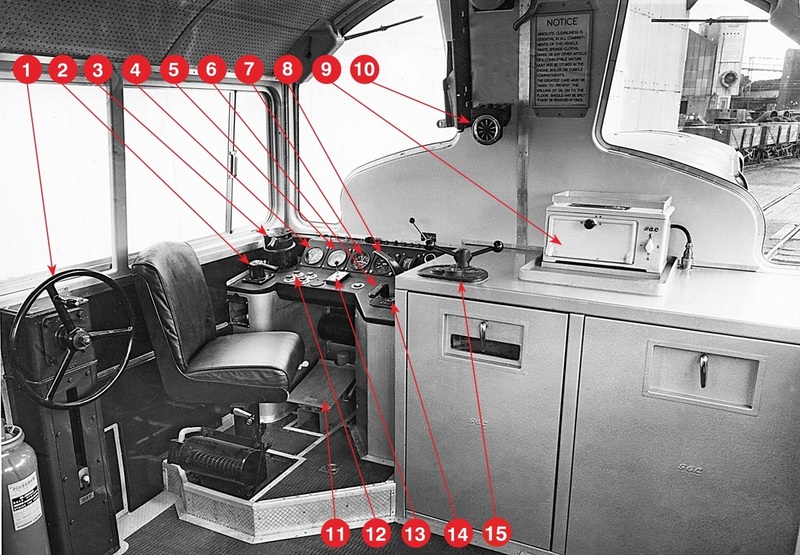 This cab shows an early vacuum brake fitted example. 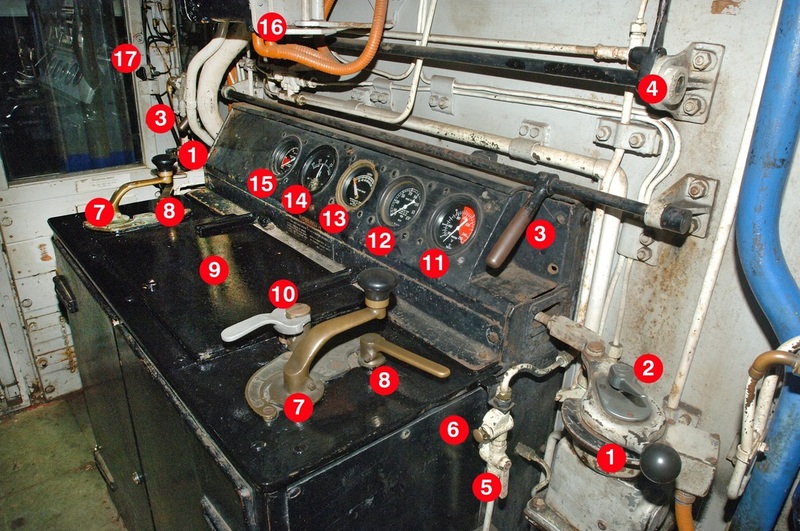 1: Straight air brake valve, 2: Power controller, 3: Volt meter showing main generator output, 4: Engine RPM meter, 5: Oil pressure gauge, 6: Vacuum brake gauge, 7: Water temperature gauge, 8: Duplex air gauge, 9: Door to power controller equipment, 10: Engine start switch (key not in position), 11: Direction switch (forward, engine only, reverse), 12: Vacuum train brake controller, 13: Cab heat control, 14: Pneumatic sand valves, 15: Amp meter and speedometer (reversible to face either driving position), 16: Whistle valve, 17: Sand application handle. 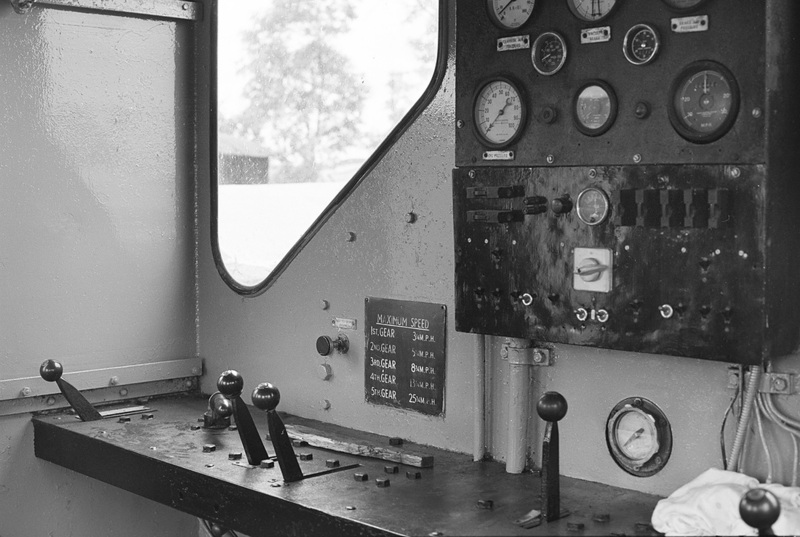 Above Left & Right: BR standard 0-6-0 shunting loco, Class 08. 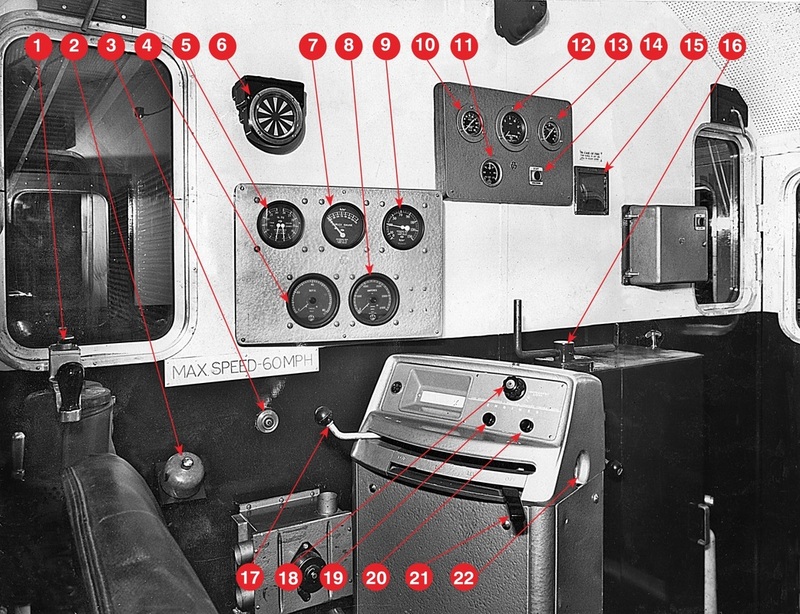 Left: Class 08. lower image shows an early loco to control tower radio telephone. Above & Left: Class 09. 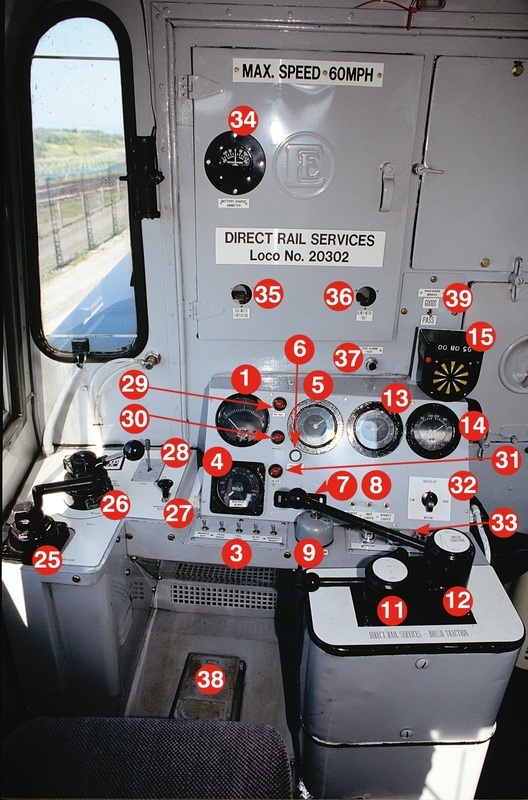 1: Train brake controller, operates either air or vacuum train brakes and proportionally the straight air brakes on the loco, 2: High speed vacuum exhauster press button, when depressed increases the speed of the vacuum exhauster to obtain a quicker train brake release, 3: Loco straight air brake valve, 4: Sanding control valve, 5: Horn (whistle) isolating valve, 6: Horn/whistle button, 7: Main power controller, 8: Master switch (forward, engine only, reverse), 9: Door to power controller equipment, 10: Engine start switch (key fitted), 11: Water temperature gauge, 12: Brake pipe pressure gauge, 13: Duplex air gauge, 14: Battery amp meter, 15: Oil pressure gauge, 16: Main generator amp meter and speedometer (reversible to face either driving position), 17: Windscreen wiper air motor and switch, 18: Fuel header tank gauge, 19: Vacuum brake gauge, 20: Equipment fuses, 21: Emergency brake, 22: Cab heat water. 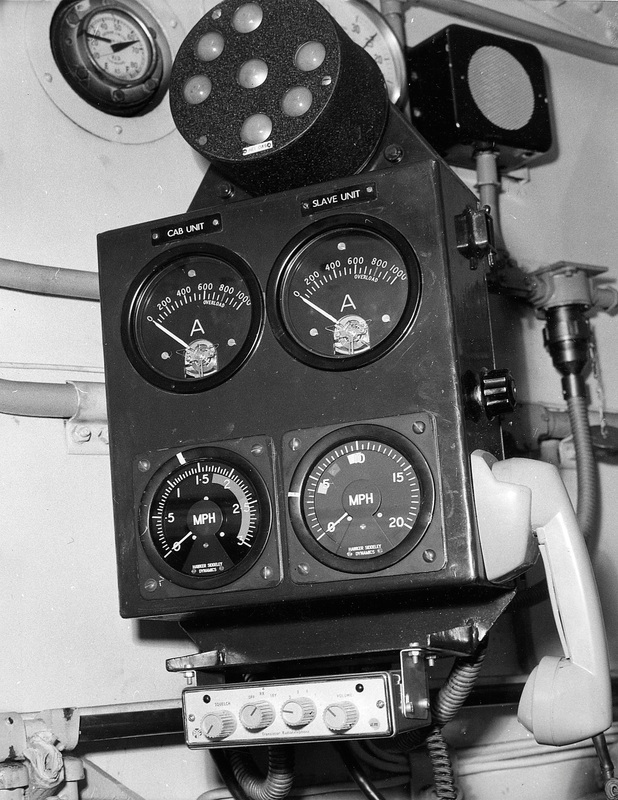 Left: Class 13 dual speedometers, ammeters, cab radio and Tinsley hump signal system display. 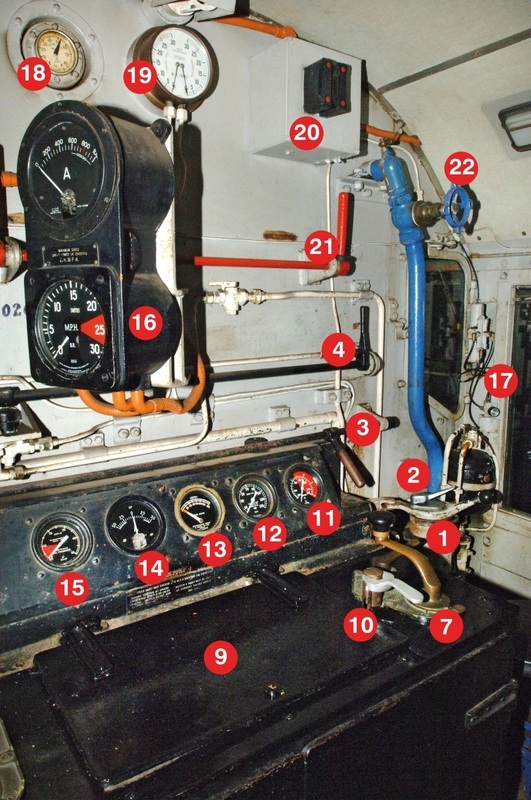 Left: Class 14 0-6-0 diesel-hydraulic. 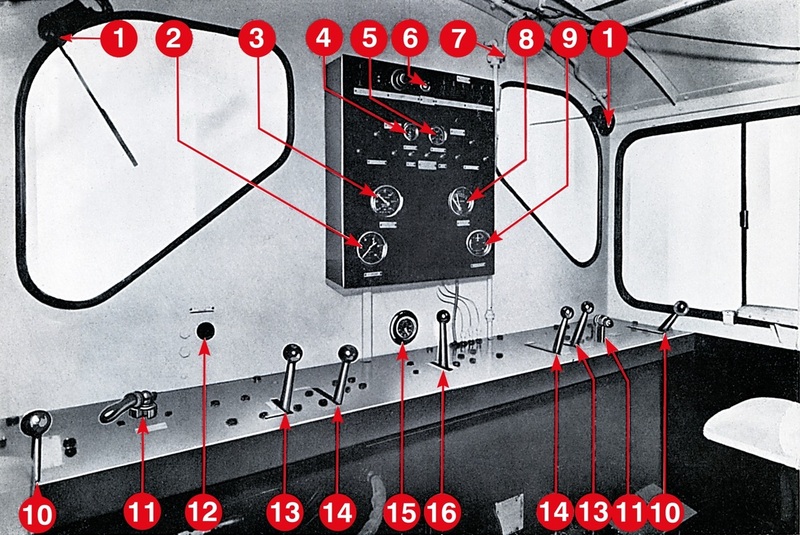 1-Main reservoir gauge, 2-Brake cylinder gauge, 3-Train pipe/vacuum chamber gauge, 4-Speedometer, 5-RPM gauge, 6-Train brake valve, 7-Straight air brake valve, 8-Sanding button, 9-Window wiper valves, 10-Engine start/stop and fire alarm test buttons, 11-Power controller, 12-Master switch (forward/engine only/reverse), 13-Horn valve, 14-Engine running light, 15-Alarm light, 16-DSD warning light, 17-Window wiper motor, 18-Fire alarm pull handle, 19-Emergency box (flag and detonators), 20-Cab locker, 21-Cab light, 22-Fire alarm bell, 23- Sun visor. 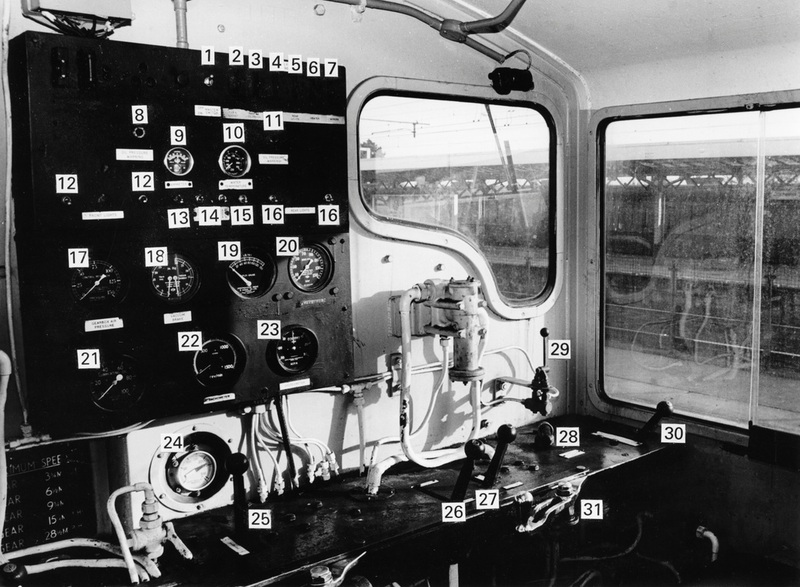 Above: BTH Type A Class 15 driving cab layout. 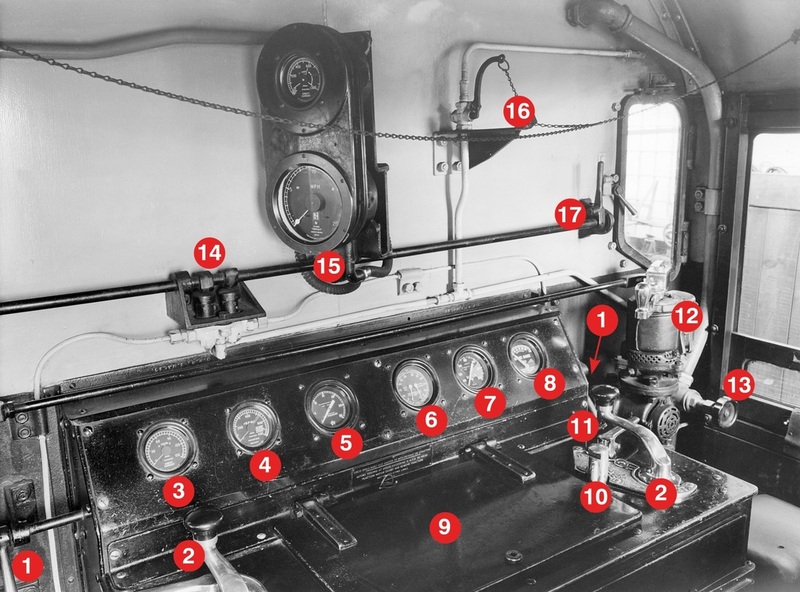 1-Train brake valve (vacuum for train, air for loco), 2-AWS reset button, 3-Windscreen wiper valve, 4-Speedometer, 5-Vacuum pipe and chamber gauge, 6-AWS ‘sunflower’ indicator, 7-Duplex gauge, 8-Amp meter, 9-Main reservoir air gauge, 10-Engine oil pressure, 11-Amp meter, 12-Engine speed in RPM, 13-Engine water temperature, 14-Local engine start button, 15-Fire alarm pull handle, 16-Handbrake wheel, 17-Power controller, 18-Indicator dimmer switch, 19-Engine start button, 20-Engine stop button, 21-Master switch - (off, reverse, engine only, forward), 22-Master key switch. 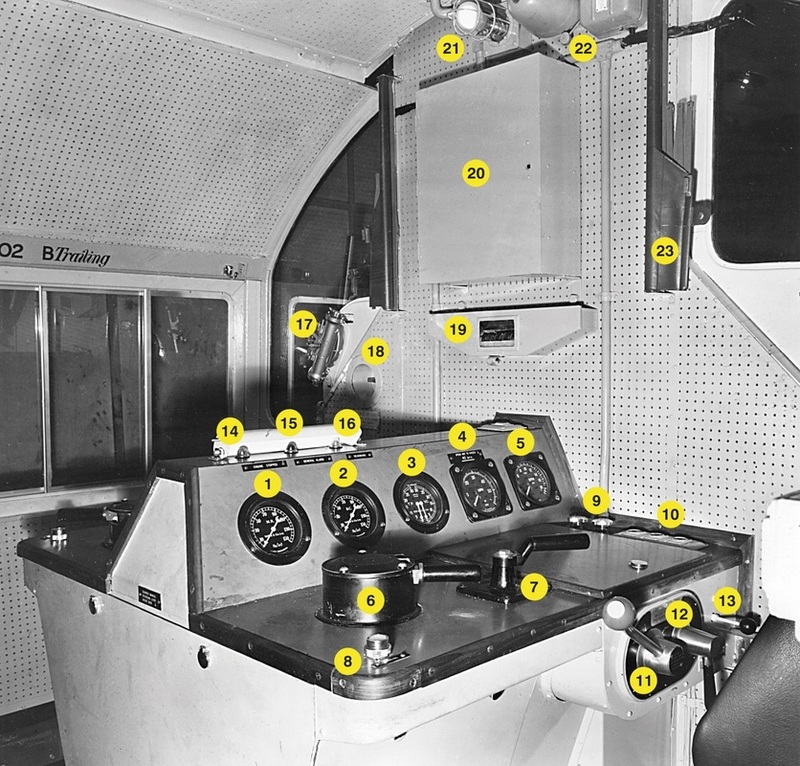 The loco illustrated is No. 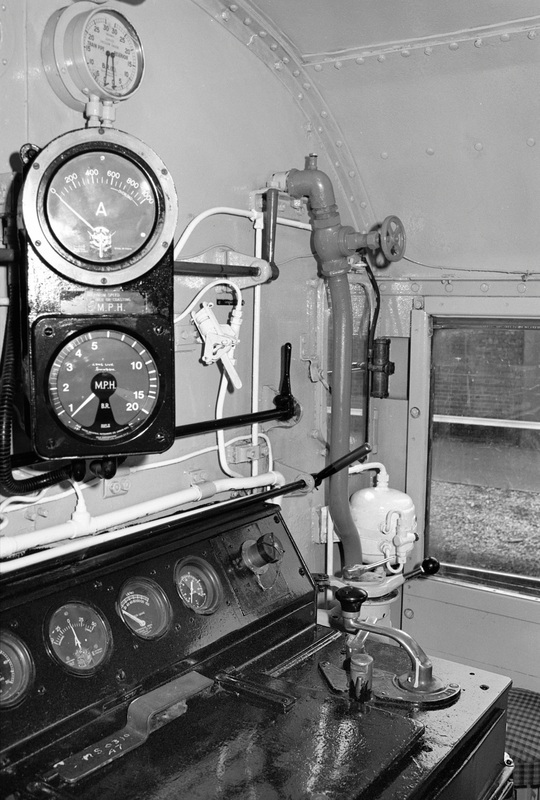 D8205 of the original Pilot order. 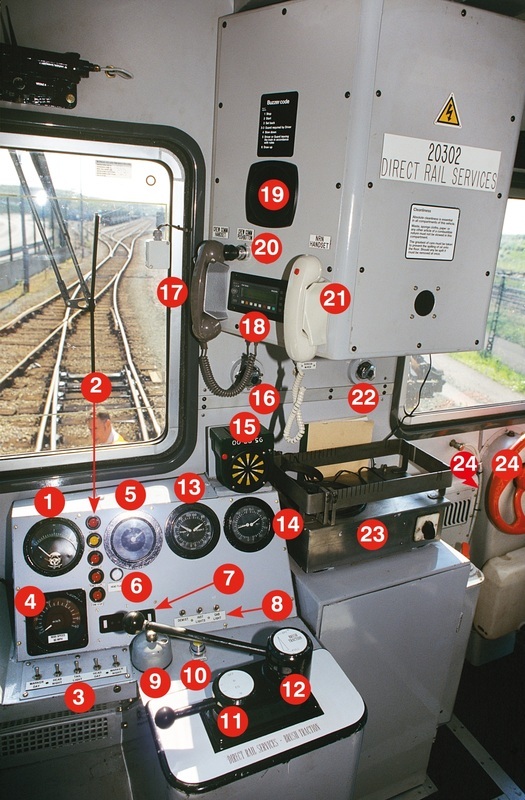 Left: Class 16 1-Deadmans ‘hold-over’ button, 2-Cab light switch, 3-Tail light switch (right), 4-Windscreen wiper motor, 5-Marker light switch (right), 6-Marker light switch (middle), 7-Marker light switch (top), 8-Marker light switch (left), 9-Tail light switch (left), 10-Fire bottle pull handle, 11-Demister and main cab heater, 12-Power socket, 13-Auxiliary cab heater, 14-Engine stopped warning light, 15-Wheelship warning light, 16-General alarm light, 17-Train brake valve, 18-Vacuum gauge, 19-Locomotive brake valve, 20-Main reservoir pressure, 21-Auto air brake pressure gauge, 22-Loco brake cut-out button, 23-Reset button, 24-Engine start button, 25-Power controller stand, 26-Engine stop button, 27-Speedometer, 28-Control switch, 29-Master switch (forward/engine only/reverse/off, 30-Ampmeter, 31-Windscreen wiper valve right side, 32-Instrument dimmer switch, 33-Windscreen wiper valve left side, 34-Instrument light switch. 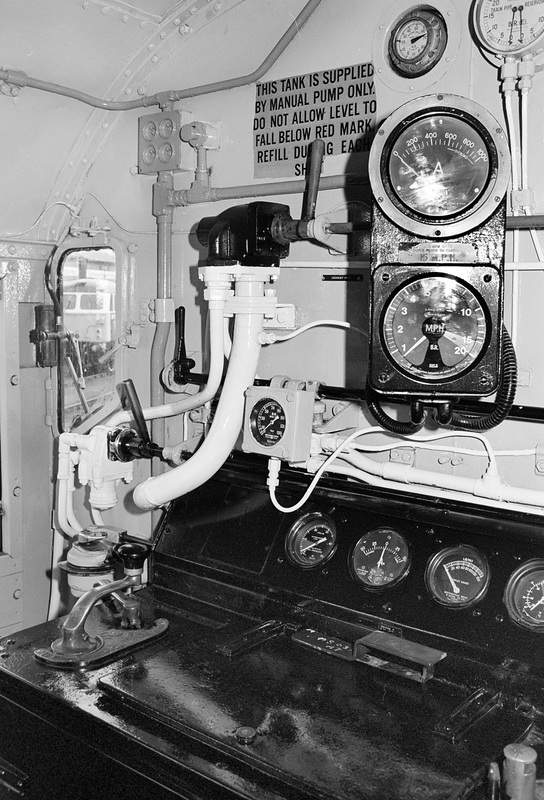 Above: Class 17 Clayton Type 1 cab controls, 1-Handbrake wheel, 2-Locomotive straight air brake valve, 3-Train brake valve, 4-Main reservoir pressure gauge, 5-Brake cylinder pressure gauge, 6-Master switch (off, reverse, engine only, forward), 7-Vacuum gauge, 8-Power controller with speedometer and traction ampmeter behind, 9-Cooker, 10-AWS ‘Sunflower’ indicator, 11-Drivers safety device pedal, 12-Engine start/stop buttons, 13-Warning horn valve, 14-Drivers key socket. 15-Engine/drive selector switch. 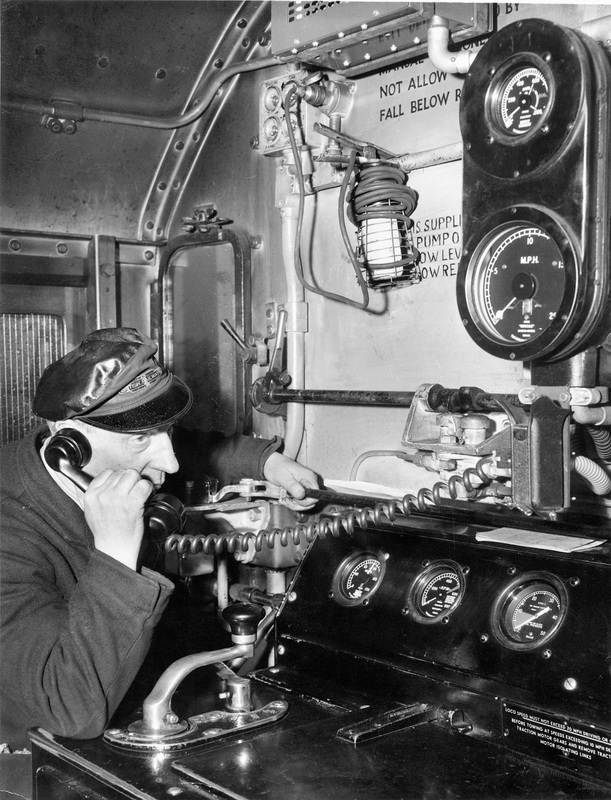 Above: Class 20 No. 20110.